During the infamously heartbreaking BLM 2014 Checkerboard Roundup in Wyoming, a chance encounter between a regal wild stallion and acclaimed photographer Carol Walker changes both of their lives forever. 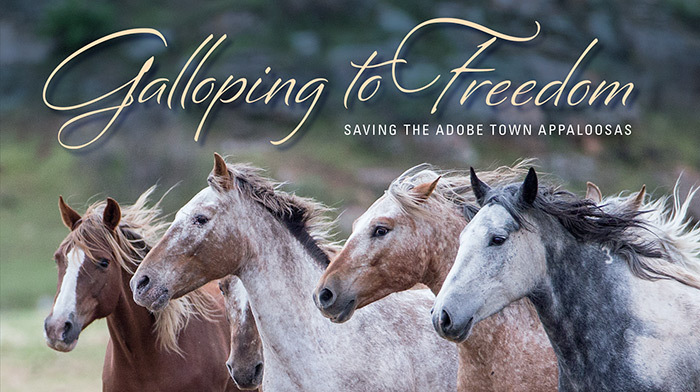 The new photo documentary book, Galloping to Freedom: Saving the Adobe Town Appaloosas, is the result of that encounter. 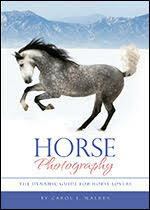 In this, the third book for this multiple-award winning author and artist, Walker’s evocative photographs and poignant prose document the story of rescuing the stallion she named Bronze Warrior and his band of mares and offspring from different BLM holding facilities and reuniting them in a place where they could live out their lives together, safe and undisturbed. Like every satisfying animal story, the venture is not without difficulties and sorrows, but ultimately, this is a tale of triumph and joy. And even better: It is true. Aged horses such as Bronze Warrior (22 when he is captured) usually are the last to be adopted and therefore are the most likely to spend their remaining years in cramped BLM pens without their families. Especially concerned for this gallant stallion and his band, Walker reaches out to Manda Kalimian of the Cana Projects for help; the two share Thoreau’s belief that “in wildness is the preservation of the world.” Together, these two staunch and vocal wild horse advocates win over even the BLM bureaucracy to the effort. Susan Watt, of the Black Hills Wild Horse Sanctuary, is the third “Reunion Team” member. The story is, by turns, nerve-wracking and frustrating, thrilling and surprising, charming, heart-warming and delightful. The captivating photographs likewise offer a widely ranging emotional journey, from touching to powerful. In combination, the images and story build to a victorious resolution. By journey’s end, one is struck by the horses’ timeless elegance and dignity, whether enduring a brutal holding facility or soaring in spirited freedom. One is equally moved by the dogged perseverance of the humans in the story. So, Reader, beware: This book might change your own life forever. Galloping to Freedom: Saving the Adobe Town Appaloosas features over 200 of Carol’s full color photographs in perfect binding, equally suitable for coffee table browsers, fine art photography admirers, or the libraries of serious equine science students. Appendices offer information on wild horse advocacy efforts, Cana Projects, and the Black Hills Wild Horse Sanctuary. 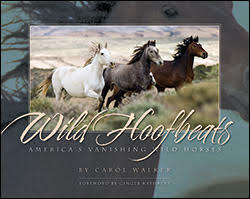 137 pages hard cover with dust jacket, large format full color book, including over two hundred of Carol J. Walker’s incredibly moving wild horse photos. Only $39.95 US + Shipping & Handling! Over 60 beautiful and moving photos by Carol of the wild horses living in the Adobe Town and Salt Wells Creek Herd Management Areas in Wyoming grace this 2019 calendar! From the small foals to the powerful, mature stallions, Carol’s images capture the spirit, beauty and pride of the wild horses in these two Red Desert herds. This calendar is dedicated to the wild horses of Adobe Town and Salt Wells Creek who lost their freedom, their families, and some of whom lost their lives in the Checkerboard Roundup of 2017. They will not be forgotten. These wild horses deserve to live out their lives in freedom on our public lands where they love and where they belong, and the fight continues to keep the free. 50% of proceeds will go to benefit Wild Horse Freedom Federation. Now only $8.00 US + Shipping & Handling! Because, in the words of author Carol Walker, they fill our hearts and capturing them on film or in digital images expresses that relationship. We want to catch and hold and show their spirit, their tremendous joy in living, their unique personalities, and of course, their incomparable beauty. And we want the quality of our images to honor our glorious subjects. Photographing horses presents a double challenge. The first being the technical aspects, the lenses, the setting, the light and speed, and how all those relate to the subject.The second element is more elusive; it is horse knowledge‚ the educated ability to see how a horse moves, sense its moods, and understand its psychology as a prey animal. Horse Photography: The Dynamic Guide for Horse Lovers presents the tools to master both technique and subject matter. More than that, the book will stir your creativity and inspire you to spend more time focusing on these animals you admire. 112 pages, hard cover 7×10 format with over 150 stunning photos by Carol J. Walker. Only $24.95 US + Shipping & Handling! An emblem of the American West and once numbering in the millions, the wild horse is considered by some today as a resource to be exploited or a pest to be eliminated. Now the wild horse is on the verge of being removed entirely from our nation’s public lands. Wild Hoofbeats takes us deep into “Adobe Town” in Wyoming’s Red Desert and one of the largest remaining wild herds in America. In passionate prose, but above all in stunning photographs that are both intimate and grand, Carol Walker convinces us to take the future of these elegant, exceptional animals to heart. Multi-Award winning! Now in its third printing. Only $29.95 US + Shipping & Handling!